Dumbbell triceps exercises focus on the triceps muscles on the back of the arms. Hold the a light weight, 2 to 5 pound dumbbell in your left hand with your palm toward your body. Spread your legs slightly with your right leg forward. Brace your body by placing your right hand on the thigh of your right leg. Keep your weight displaced evenly over both legs. Pull your shoulders down and back to straighten your spine. Look at the floor in front of your right foot. Bend your elbow and raise your upper arm until it is close to your body. Keep your forearm vertical to the floor. Straighten your elbow and push your arm toward the wall behind you. Hold the position for a few seconds and return to the start position. Always keep your arm close to your body and avoid the urge to press your arm outward from your torso. Do 5 repetitions on each side. Increase the number of repetitions as you gain strength. Biceps curls work not only your biceps but also strengthen your rotator cuff. Sit on a weight bench or stand with the back of your arm resting on the bench support pad. Hold a dumbbell in your hand, arm extended, with your palm pointing upward. Slowly curl your arm to bend your elbow using your biceps only. Avoid the urge to swing the weight upward toward your shoulder. Keep your wrist and forearm in a straight line and don’t bend your wrist forward or backward. Slowly lower the dumbbell and your arm back to the start position. The key to successful biceps curls is slow, deliberate and controlled motion. 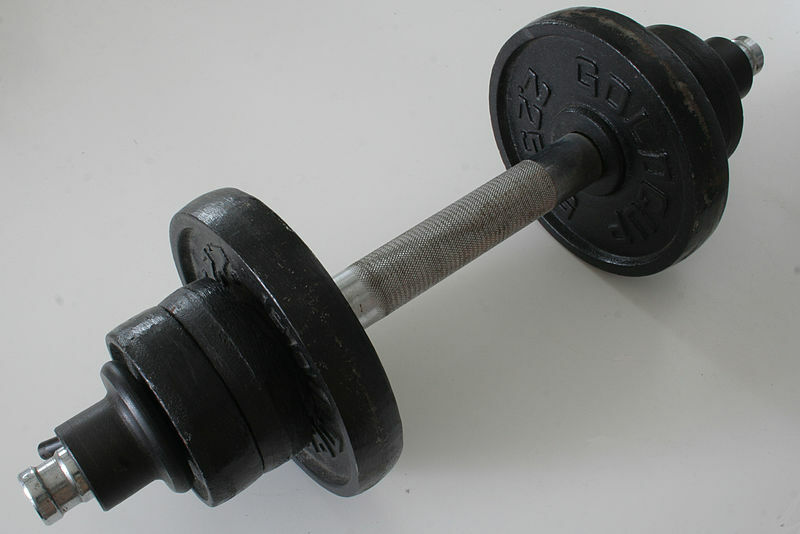 Try to do 5 to 7 biceps curls using a 2 to 5 pound weight with each arm in the beginning. Increase the number of repetitions and increase the weight as your arms grow stronger.